NYC Teachers: What do YOU think of Pearson’s NYS Common Core tests? Oh wait – we aren’t supposed to say anything about Pearson’s NYS Common Core tests. What do you think? Are Pearson’s NYS Common Core tests valuable and important? Please leave a comment on this post (or send me an email: katielapham1@gmail.com). I will respect your anonymity. I just ask that you include the following information: borough, NYC school district and school level (middle or elementary). 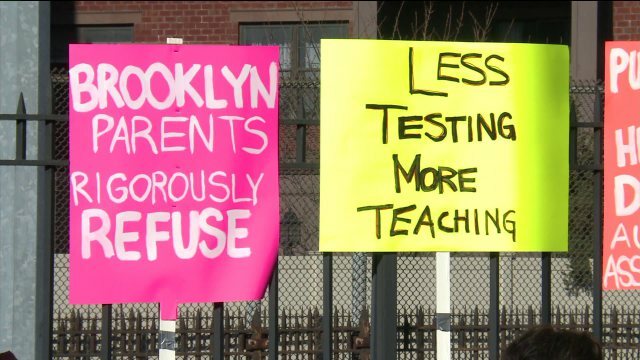 I am soliciting teacher feedback because I strongly disagree with Fariña’s remarks about the value of these tests and feel that it’s important for ALL parents – not just those in Brooklyn’s District 15 or Tribeca – to know the truth about these tests. I applaud the brave teachers at Park Slope’s P.S. 321 and Tribeca’s P.S. 234 who have criticized the tests to parents. Their eloquent testimonials are spot on. Countless teachers bemoan Pearson’s NYS Common Core tests behind closed doors, but due to fear here in NYC, few teachers speak out against them. As a mandated reporter and educator of English-language learners (ELLs), I refuse to remain quiet. Since 2013, I have had to administer these horrendous Pearson Common Core tests to my students. Each year I tell myself that I will follow the lead of NYC’s Teachers of Conscience by refusing to administer them. But I haven’t yet taken that step. Instead, I have this blog. The 2016 NYS testing season begins on April 5, 2016. It includes Pearson’s NYS Common Core ELA and math tests (a total of six days), the NYSESLAT for English-language learners, the state science test for 4th graders, Common Core field tests for select grades in select schools, the Chinese Reading Assessment for students in Chinese dual language/bilingual classes and the Spanish (ELE) Reading Assessment for students in Spanish dual language/bilingual classes. This means that out-of-classroom teachers, like myself, will have to suspend their teaching programs (mine is mandated) in order to test students. Our kids who are most in need of support – both academic and emotional – will be deprived of their services during this time. It also means that teachers will feel disingenuous as they encourage students to do their best on non-teacher created tests that insult our intelligence. Pearson’s NYS Common Core tests have been widely discredited for being poorly constructed, developmentally inappropriate, and invalid. The New York State Education Department (NYSED) manipulates cut scores in order to legitimize the false narrative that our schools are failing. Not only are cut scores constantly changing but the NYSED sets them AFTER the tests have been scored. Thus, the NYSED’s claim that 70% of our students are failing is invalid. It is a truly soul-crushing time of the year for everyone involved, except – perhaps – for Carmen Fariña. Will she be deprived of valuable instructional time to administer and to score meaningless tests? Will she have to watch students, as young as 8-years-old, shut down, cry, throw up, call themselves stupid? Will she go home at the end of a grueling testing day in tears? Will she have to to explain to a scared and confused newcomer ELL why he/she has to take the ELA test after just 12 months in the system followed by the NYSESLAT? Fariña is not in the trenches. We are, and – for the sake of our beloved students – our stories deserve to be told. NYC teachers – I implore you to use this blog post to share your views about Pearson’s Common Core tests. We will not be silenced or disenfranchised. We want our students to thrive, and to be motivated to make the world a better place. This testing program is a kick to the stomach. Enough is enough. New York City parents may be hearing that the New York State (NYS) Common Core math and ELA (English-language arts) tests will be better this year and are of value to educators and students. This does not tell the whole story. Here’s the truth about the 2016 NYS tests. Pearson created the 2016 tests. Questar Assessment Inc., which, in 2015, was awarded a $44 million, five-year contract by the New York State Education Department (NYSED), is in the process of developing test questions for future tests. However, their tests won’t be used until 2018. According to a January 2016 NYSED memo,”Questar Assessment, Inc. has replaced Pearson and is responsible for the construction of this year’s test forms and guidance materials.” Questar did not create the actual 2016 tests and test questions. While a total of 156 NYS educators may have reviewed the 2016 tests, NYS educators did not participate in the writing of the 2016 test questions. The actual development of the 2016 tests was done by Pearson. According to the New York State Education Department (NYSED), teachers will work with Questar to create field test questions in 2017. I would like to know how these 156 educators were selected – were any critics chosen?- and if their recommendations for change – if any – were taken seriously. The shortening of the 2016 NYS Common Core tests is insignificant. Students will still spend a total of six days taking the math and ELA tests (three days each). The tests are untimed this year so students could potentially sit for an even longer period of time to complete the assessments. The below comparison charts show how minimal the changes to the tests are. Also, shaving off a few questions does nothing to improve the quality of the test questions. The tests are still bad. In addition to illustrating the sharp increase of test questions since 2010, this graph, created by NYC parent Amy Gropp Forbes, shows how insignificant the shortening of the 2016 is. The NYS Common Core ELA and math tests are not the only assessments administered this spring. NYSED recently released the 2016 field test assignments for NYS schools. Please click on this NYSED link to see if your school has been signed up to field test future math, science or ELA test questions. The June 2016 administration of the field tests is of no value to teachers or students, the latter of which are being used as guinea pigs. Similarly, many NYC parents are unaware of the excessive and developmentally inappropriate testing our English-language learners (ELLs) are subjected to. After only 12 months in the system, all ELLs in NYS must take the ELA test (ELLs are not exempt from the math test in their first year because translated versions of the assessment are available). During the recent parent-teacher conferences, it pained me to share with parents my goal for second graders who were at the expanding (advanced) English-proficiency level: to test proficient on this year’s NYSESLAT (New York State English as a Second Language Achievement Test). Administered each spring, the NYSESLAT is a grueling four-part test, now aligned to the Common Core, which assesses ELLs’ speaking, listening, reading and writing proficiency levels in English. It is a content-based assessment, not a true language test, and, in my professional opinion, it is wholly inappropriate to administer to ELLs at any grade level. Sentence writing, for example, is expected of ELLs in kindergarten. Spending my precious minutes discussing this highly flawed standardized test was bad enough, but my rationale for getting students to test out (test proficient or pass) tightened the knot in my stomach. If my expanding (advanced) ELLs do not pass the NYSESLAT this school year, in third grade they will have to take it again right after the widely discredited NYS Common Core ELA and math tests. I signed up to be a teacher, not a tester. I can’t think of a single working NYC teacher who finds the NYS Common Core tests to be a “valuable experience for our students” (as per New York City Department of Education (NYCDOE) chancellor Carmen Fariña’s 3/15/16 letter to parents). Pearson’s NYS Common Core tests are not teacher-created, nor do they accurately reflect the contextualized skills and knowledge that students gain in the classroom. The tests are developmentally inappropriate, poorly constructed and contain ambiguous questions. In 2014, 557 New York State principals signed this letter denouncing the tests. Despite the so-called changes to the 2016 tests, the content and the skills that are tested remain the same. In painting a broader picture of the impact of NYS’s Common Core testing program on public education, it’s important to highlight that everything revolves around the highly flawed NYS Common Core tests. Despite the NYCDOE’s argument that multiple measures are used to determine a child’s promotion to the next grade, the testing program is the sun around which all other aspects of public education orbit. Schools with low test scores – due to poverty, high numbers of English-language learners and/or students with disabilities – are particularly vulnerable to scrutiny, micromanagement and excessive testing. These schools face state reviews and pressure to adopt Common Core test prep curricula (ReadyGEN, GO Math! and Expeditionary Learning, for example), all at the expense of offering students an authentic and inspiring education that truly meets their social, emotional and academic needs. I have spent the past 10 years in Title I elementary schools in New York City. Our students go on fewer field trips, are exposed to a narrower range of books, and participate less in the arts. In Title I schools, beginning in kindergarten, there exists such a strong sense of urgency to prepare students for the skills they will need in order to do well on the state tests that not a moment is to be “wasted.” Cutting and pasting in first grade is wrongly viewed as lacking rigor. As a result, it’s not uncommon to find a second grader struggling to use glue and scissors. Folding paper, I’m discovering, is an undeveloped skill nowadays. In schools with low test scores, there is no free play and, for the most part, recess only happens at lunchtime (weather permitting). Any classroom “play” must reinforce academic skills. School days can be suffocating for students and teachers alike. Curriculum pacing guides must be followed faithfully, which has killed spontaneity and deprives students of opportunities to learn about topics outside of the curriculum. I’ve even had to sneak in Martin Luther King, Jr. and Chinese New Year. My rich author study units highlighting the important works of Ezra Jack Keats and Leo Lionni, among others, are collecting dust. I mourn this loss of freedom every day I go to work. Forget about using students’ interests to shape instruction. “Choice” is only offered to students within the confines of the Common Core-aligned curricula. Andy Yung, a talented pre-K teacher in Queens, presented this slide at last weekend’s Jackson Heights People for Public Schools event. What is of chief importance to “struggling” schools is the raising of scores on poor quality tests that do not reflect how each student has grown in his or her own way. As part of their test preparation program this year, a Bronx elementary school has already administered two NYS ELA and math test simulations: one in December 2015 and the other in March 2016. Each simulation lasted six days (3 periods each day) and was harder than the real tests, according to a teacher. While this is an extreme case – and arguably abusive – test prep is still occurring citywide even at schools with high test scores. 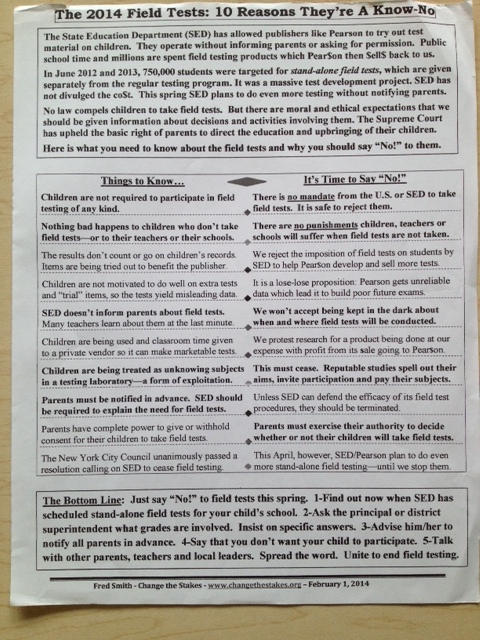 The organized opt-out movement here in NYC is led by local parents and educators who spend an inordinate amount of time researching the NYS Common Core testing program and educating themselves on developmentally appropriate pedagogy. Change the Stakes and NYC Opt Out, among others, report the truth through social media and through testing meetings that are being held all over NYC. While some NYC parents may have initially gravitated to this movement in order to protect their own children from educational malpractice, a growing number of opponents of the state testing program are opting-out for justice. Boycotting the tests and depriving the state of data is seen as the only way to effect change in our schools, and to curb the further privatization of public education (see what’s happening right now in the United Kingdom). These parents and educators envision a different educational experience for all children of New York State. Bronx principal Jamaal Bowman speaks out against the current NYS Common Core testing program. As reported in this November 2015 Huffington Post article, “Jamaal Bowman knows his kids and with the research to back up his approach, he makes it clear that by empowering teachers and inspiring children toward their passions, in an atmosphere that embraces our diversity, we have the capacity to realize the goals that the current reforms are failing to produce.” I also appreciate Brooklyn New School principal Anna Allanbrook’s weekly letters to parents , which showcase her school’s whole child approach and contrast sharply with NYS’s test-based education reform initiatives. In Allanbrook’s March 7 letter, she links to a speech delivered by principal Bowman and writes, “Jamaal suggests that all parents exercise their right to opt out of high stakes testing, advising parents to demand more holistic assessment of their children. Jamaal’s words remind us of the words of Dr. Martin Luther King, Jr. who said, “Injustice anywhere is a threat to justice everywhere. We are caught in an inescapable network of mutuality, tied in a single garment of destiny. Whatever affects one directly, affects all indirectly.” These are brave, ethical NYC school leaders whom I greatly admire. What about all the thoughtful and experienced NYC classroom teachers who find fault with these tests and don’t view them as a valuable teaching tool? The teachers of the MORE caucus of the UFT (United Federation of Teachers) support opt-out and oppose Common Core, Danielson teacher evaluations and high-stakes testing. MORE candidates, such as Jia Lee, who testified against high-stakes testing in a U.S. senate hearing last year, are running in this year’s UFT election. Teachers of Conscience refuse to administer both state and local standardized assessments. Teachers’ legitimate concerns, based on years of experience and knowledge of developmentally appropriate pedagogy, are absent from the official story that’s being told to NYC parents. In fact, NYC educators are being silenced and, as a result, are afraid to speak out. This is an attack on our democracy and goes against the so-called critical thinking that the NYCDOE purports to be promoting through Common Core. This is just a glimpse of what’s really going on in NYC public schools. There is, of course, more to the story. Here is a link to view the March 2016 NYCDOE’s Student Participation in Grades 3-8 New York State Tests Parent Guide. Regardless of your child’s performance level, it is a parent’s right to opt out. On 2/21/15, Anthony Cody published my latest post on his new blog, Living in Dialogue. In it, I detailed the mid-term GO Math! and ReadyGEN ELA benchmark assessments that I reluctantly and heavy-heartedly had to administer to my first grade students the week of February 9, 2015. Not only are our youngest learners being subjected to excessive standardized testing, but they are also missing out on meaningful learning experiences. 1.) Chancellor Fariña acknowledged that she invited herself to District 19 after noticing that the district wasn’t included on her tour of NYC school districts. She stressed the importance of visiting “underserved and underheard” communities such as East New York, Brooklyn. 2.) Right away, Fariña asked if there were any educators in the audience. She reiterated her pledge to bring back respect to NYC teachers and principals, and she encouraged us to speak up at the meeting. This put me at ease until I got no reaction from her after delivering my speech (posted below). 3.) Fariña assured us that the NYCDOE would rely less on outside consultants for curriculum and professional development. She sang the praises of the wonderful work already being done in our schools and called on schools to share ideas and best practices. I believe she said that she’d reward schools for doing this. 4.) Fariña declared that she believed in the Common Core. Her view is that “it’s not a curriculum; it’s a series of strategies.” She said memorizing information won’t get our kids good jobs. This statement reminded me of last year’s NYCDOE pro-Common Core ad that tormented me on my daily subway commute. 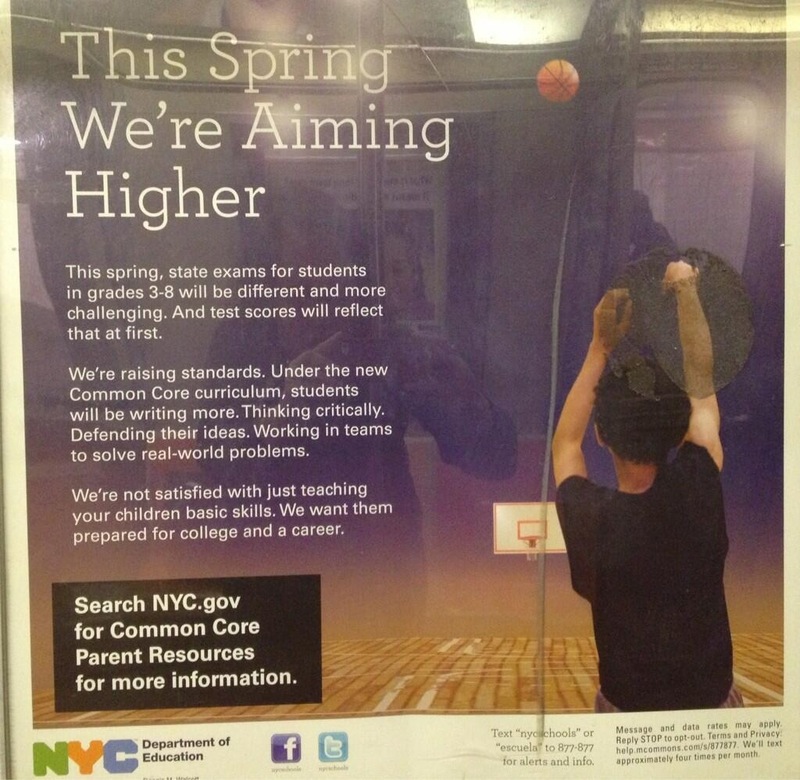 The ad – posted below – implied that schools just taught basic skills in the pre-Common Core era. This is false and misleads the public. Critical thinking and higher order thinking questions are not new concepts and have long been practiced in our schools. Did Fariña not see this happening in her schools? I don’t think so. It’s worth noting that, contrary to Fariña’s interpretation, last year’s NYCDOE ad referred to the Common Core as a curriculum. 5.) Trailers are a big issue in District 19. Fariña said that in five years, trailers would be gone from New York City public schools. My District 19 elementary school is my second family. My English-language learners are like my own kids; I’ve taught their siblings, I know their families and I help newcomers adjust to both a new language and to a new culture. I’m here tonight as an advocate for them, and also for my own daughter who starts kindergarten this fall in District 13. The current Common Core testing program is unsustainable and developmentally inappropriate, and it must be stopped. The Common Core state tests are meaningless to me as a teacher. They are also unreliable measurements of student learning and achievement. They do not reflect my students’ knowledge and how they’ve progressed over the course of the school year. 2.) The four-part NYSESLAT assessment for English language learners (ELLs): speaking, listening, reading comprehension passages and multiple choice questions and writing, which is comprised of 2 essays: 1 fact-based and 1 picture description. April 9 – May 16. 3.) New York State Science Performance Test (grades 4 & 8). May 21 -30. 4.) New York State Science Written section (grades 4 & 8). June 2. 5.) MOSL (local assessments) used for teacher ratings (at many, but not all, schools). Grades 3-5 students will complete a reading and writing performance assessment, and a math Scantron online Ed performance will also be administered. May 5 – 12. 6.) Pearson field testing. June 2 -11. The New York City Council has already unanimously passed a resolution calling on the State Education Department to cease fielding testing. Chancellor Fariña, I call on the NYCDOE to opt-out of Pearson’s upcoming field tests. At the very least, can you please ensure that NYC parents are notified in advance that Pearson field tests will be administered. It would be helpful to send principals a form letter that notifies parents of the date, grade and subject area of the field test. It should also state that the field tests are not mandated, and it should ask parents whether or not they consent to having their children participate. Please read this field test fact sheet produced by Fred Smith of Change the Stakes. You can print out copies here. Please spread the word that this is happening! Our students deserve authentic, teacher-created assessments that can be used for instructional and diagnostic purposes. These NYS Common Core tests don’t do that; rather they exploit children for political and economic gain. Today I administered DAY THREE of the 2014 NYS Common Core English-language arts (ELA) assessment to fifth grade English-language learners (ELLs) and former ELLs who are entitled to extended time on state assessments. For the third day in a row, my kids sat in the testing room for 135 minutes (2 hours and 15 minutes). This week, my group of 10-year-olds tested in ELA for a total of six hours and 45 minutes. The behavior I witnessed today was not due to lack of “grit” on the part of my students. They tried their best and didn’t give up. Whenever I proctor these exams, I’m always amazed by my students’ resilience. They make me proud, but it’s disheartening to see them suffer on a test that they don’t realize is completely meaningless and, in no way, reflects the beautiful classwork they’ve done this year. 3.) Many students were scared that they would be “left back” if they didn’t finish the test. 6.) Kids cried at drop off today. Some cried during the test and a few vomited. One general education student had a nervous breakdown and had to take the test in a separate location. 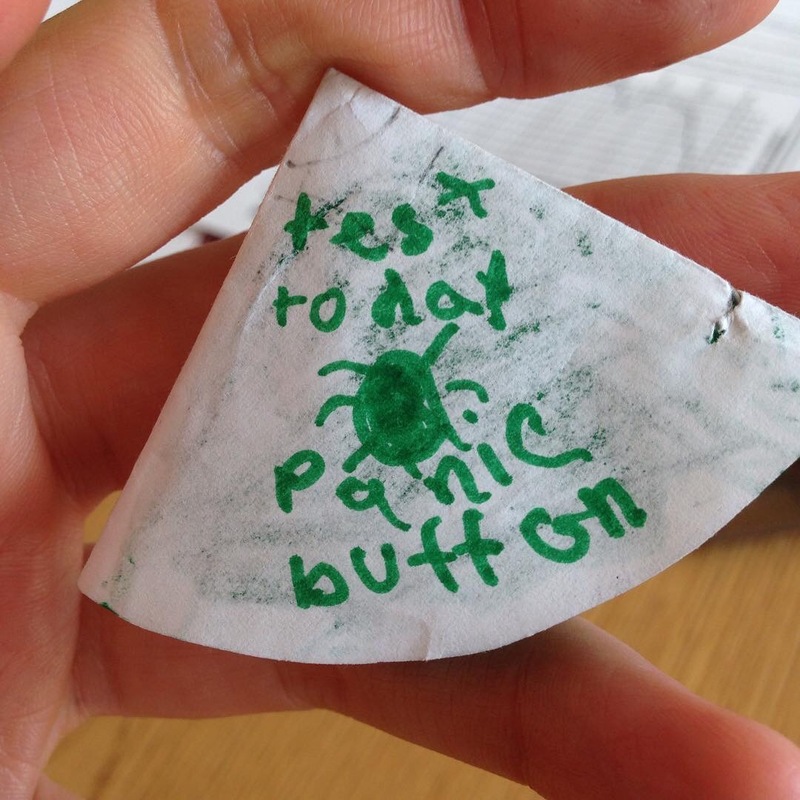 This student’s anxiety was so intense that the teacher thought the child would run away. 7.) There were numerous reports of students answering the questions by simply copying random sentences from the reading passages. What is wrong with the NYSED? Do they realize that so-called college readiness DOES NOT mean college-level work in elementary school? Are they punishing our students, educators and parents because of the growing test resistance in New York State? The Board of Regents and John King must be held accountable for their gross mismanagement of our public schools which has, among other disasters, resulted in the unnecessary suffering of our students. *P.S. 321 in Park Slope, Brooklyn will be protesting this year’s ELA exam tomorrow (4/4/14) from 8:15 – 8:35 am. It will take place outside the school.